Project planning is the foundation of managing a project. Jennifer Bridges, PMP, offers a basic introduction to this crucial task anyone leading a project is going to need to know. 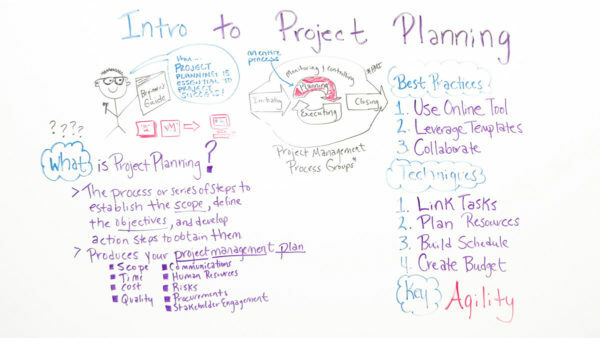 Jennifer offered not only the basic components for a project’s planning but techniques that will help you implement those plans throughout the lifecycle of your project. But even if you’re not a professional project manager and have only just recently found yourself in a leadership position for a project, then you may find this article on Project Planning for the Accidental Project Manager helpful. Pro-Tip: The success of your project planning depends not solely on following a good outline, but having the tools with which to work out those details in a way that is both collaborative and offers real-time views of the work as you plan, monitor and report. Sticky notes and even spreadsheets may offer some help, but you’ll want an online software suite that addresses your needs.Thanks for watching! Well, today, we’re talking about the introduction to project planning. Project planning can be the most empowering thing a project manager can do. Here’s why. Project planning is essential to project success and communicating with the entire team. As a matter of fact, project planning is so important, it is an entire process of the five project management process groups. What is project planning? Project planning is the process or series of steps that a project manager goes through to establish the scope of the project, define the objectives, and develop the action steps to meet them. Once you do your planning processes you produce your project management plan. Within your project management plan you have your scope, your time, and your cost of the project in addition to your quality requirements that you have to meet. You also identify your communications plan and who needs to know what, when, where, and how. It also identifies your human resources plan, how you go about obtaining your human resources for the project. It also identifies your risk planning and how you identify and mitigate your risks for the project. It also identifies your procurement plan, how you go about procuring other resources for the project. And, also your stakeholder engagement plan, how you get your stakeholders engaged into the project. You can see these are very empowering. There are some best practices that we recommend for your project planning. Number one, use an online tool. You may use sticky notes, Excel spreadsheets, or other tools to help you in your planning, but we want you to think about moving away from those as your main project management tool to just assisting you in your planning. You really want to use an online tool for the planning and the project management of your project. You also can leverage templates. Move away from starting every time with a blank piece of paper. By using a template you can save time and effort. You also want to remember to collaborate with other team members. By collaborating you can get information about the tasks required to do the project. There are certain techniques you want to remember when you’re planning. You want to remember to link your tasks because there are tasks that must be completed before other tasks can be started. You also want to plan your resources. What resources do you need? What skill sets do they need? When do you need them to come on board? You also want to build your schedule so you’ll know time lines for not only certain tasks to be done but when the entire project will be done. You also want to create a budget and manage and track it along the way. The key to all of this is agility. By having an online tool you can plan and replan quickly and efficiently all along the project.If you need a tool to help you with your project planning then sign up for our software now at projectmanager.com.